An original concert poster for three performances by Queen which took place at the Groenoordhallen in Leiden on 11. June 1986 as part of their’Magic’ tour. The poster is rolled and features a large black & white image of the group on stage with venue details above and ticket details below. It measures 83cm x 116cm (32.75 inches x 45.5 inches). An 8cm x 7cm (3.25 inches x 2.75 inches) piece has been torn from the upper right corner. There is wear & tear and blue tack stains to the edges and corners. The condition is very good minus. Our Grading System Explained. Mint = As new. Near mint = Almost like new with one or two very minor flaws. Excellent = Minor wear yet looks attractive and is perfectly usable. Very Good = Some wear and tear but overall presentable and usable. Good = Apparent wear and tear but with obvious deterioration of the condition. Poor = Extremely worn. A plus or minus after the grading indicates that the condition is marginally higher or lower than the stated grade. 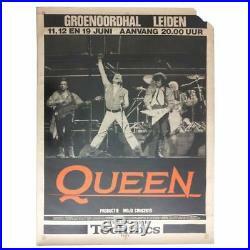 The item “Queen 1986 Groenoordhallen Leiden Concert Poster (Netherlands)” is in sale since Wednesday, January 9, 2019. This item is in the category “Music\Music Memorabilia\Rock\Posters”. The seller is “tracksuk” and is located in Chorley. This item can be shipped worldwide.